How Do Crabs Live Out of Water On Land and Breathe Air With Their Gills When They Have No Lungs? True crabs are crustaceans that have a short projecting “tail” or reduced hidden abdomen, while others such as hermit crabs, horseshoe crabs and crab lice, are not true crabs. Crabs can be found in oceans all over the world, and many crabs in tropical regions live in freshwater and on land. They are usually covered with a thick exoskeleton, and armed with a single pair of claws. Crabs have gills to extract oxygen from the water like a fish, and do not have lungs. But they can survive for long periods out of water, and some crabs live almost exclusively on land. They can do this and survive comfortably if their gills are kept moist. The water on the gills will absorb oxygen from the air which can then be used by the gills just like if it was in the ocean. By finding cool, dark and moist hiding places when on land, they can keep their gills from drying out and avoid predators. Plates around their gills also help seal in moisture and prevent water loss. Many crabs that live on land also obtain water from their food and surrounding habitat, which they can then store in their blood, bladder and specialized compartments in their bodies. 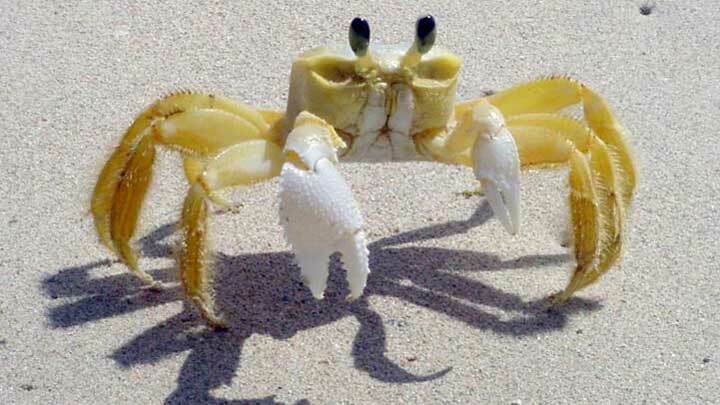 Crabs love to walk sideways and have complex behavior patterns. Do all Salamanders Lose their Gills and Develop Lungs and can they Breathe Underwater? How Big Can Crabs Grow and Can They Grow As Large As Monsters In Movies? Can Crabs Swim Underwater or do they Just Walk Along the Ocean Floor Looking for Food?